Bonjour my lovelies. Welcome back to the blog. 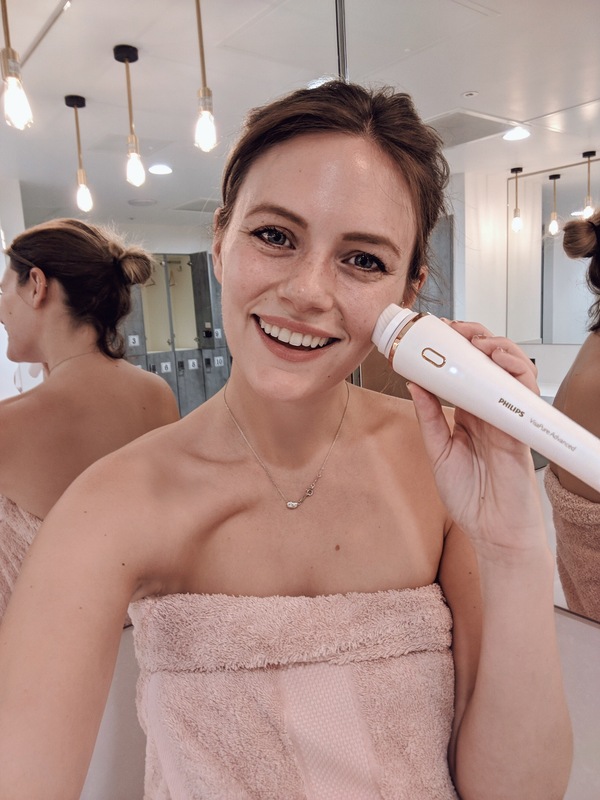 Got a couple of things to discuss today – 1) being ill and out of action for FAR too long – and 2) my new favourite life changing beauty product from Philips – the VisaPure Advanced. First things first – where have I been recently? I know I have been missing in action over the past couple of weeks but if you have been following me on Instagram you will know that I have not been a well bunny at all. In fact, I actually haven’t been this ill in years. I won’t go into too many details but long story short, I have had some weird virus in my lungs and I have been bed bound for about 10 days, which has not been the one. I am currently back at my parents’ house feeling super sorry for myself, waiting to head back to the doctors and see if they can work out why I am just not getting better. SO DULL. But I had a bit more energy this morning, so I thought I would get a blog post written, so my blog doesn’t go as off radar as I have been. One big thing I notice about being so ill, is that all self-care and general hygiene goes straight out the window. Everything is just one big effort that you don’t have the energy for. Getting dressed? Not going to happen. Washing your hair? That is a BIG no no. Taking off nail varnish you applied 3 weeks ago? Ain’t nobody got time for that. You actually get so disgusting on the outside – just because you are feeling disgusting on the inside. Please tell me it is not just me? I am not joking when I say that my hair was so matted on top of my head, in what once was a sort of messy bun – that I can whip my hair back and forth, vigorously, and it just won’t move. BUT one of the only things that I have tried to keep on top of, and the one thing that makes me feel a billion times better and slightly more human, is having a proper skincare routine every single evening to send me off to sleep. After a long day of feeling so horrifically ill, sweaty, miserable and bored, I am livingggg for getting into a bubble bath, lighting some candles, and then giving myself a little TLC in the skincare department. When I say that using the VisaPure Advanced has been my happy time recently, I am not lying. I have only had it for just over a week and it is already my new best friend. “What is this VisaPure Advanced?” I hear you yell in excitement. 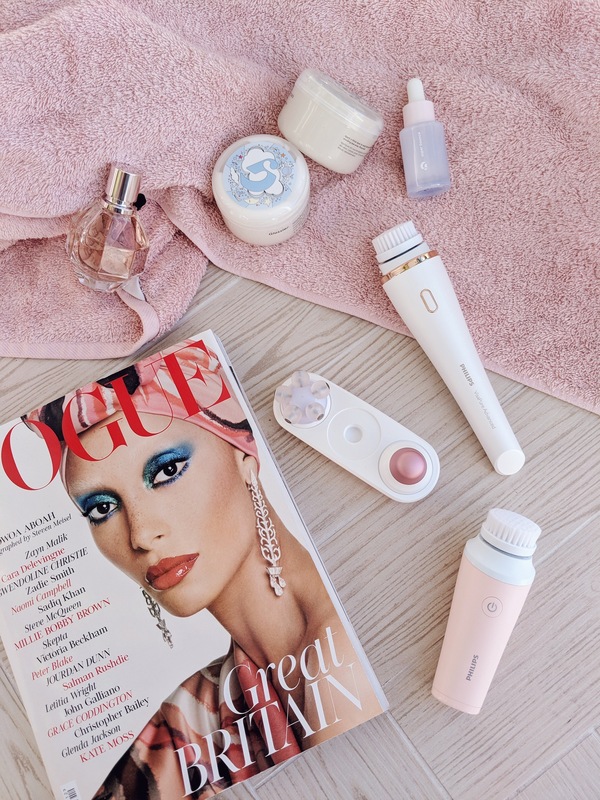 Well, is basically a three-in-one facial device – which in plain old English is a funky new electric skincare brush – that has 3 different attachments for 3 different skincare treatments. There is a cleansing head attachment, a facial massage attachment and an eye care attachment. I start off by removing any make up I have been wearing by using a micellar water. Then I apply my cleanser all over my face (I have been mixing it up recently between an oil based cleanser,as shown in these images, or my cream or gel cleansers). As I haven’t been wearing much make up recently – and I have not worn any foundation– this has been a great time to really get a good cleanse. 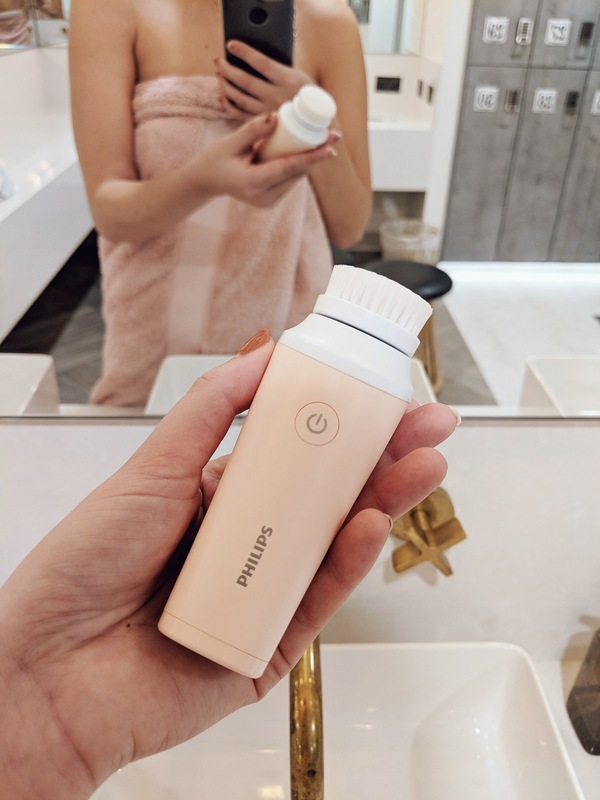 So once I apply the cleanser, I then pop the ‘cleansing’ head onto the VisaPure Advanced, run that under warm water (this will forever freak me out running electrical things under water – which is strange as I use an electric toothbrush every single day ha) and then I start to wash away the day. I spend 20 seconds on each side of my face – working from nose to ear (it tells you when 20 secs is up and to switch over by pausing briefly) and then I do another 20 seconds on my forehead until I am squeaky clean. This brush head is SO soft – so it is the perfect gentle cleanse. 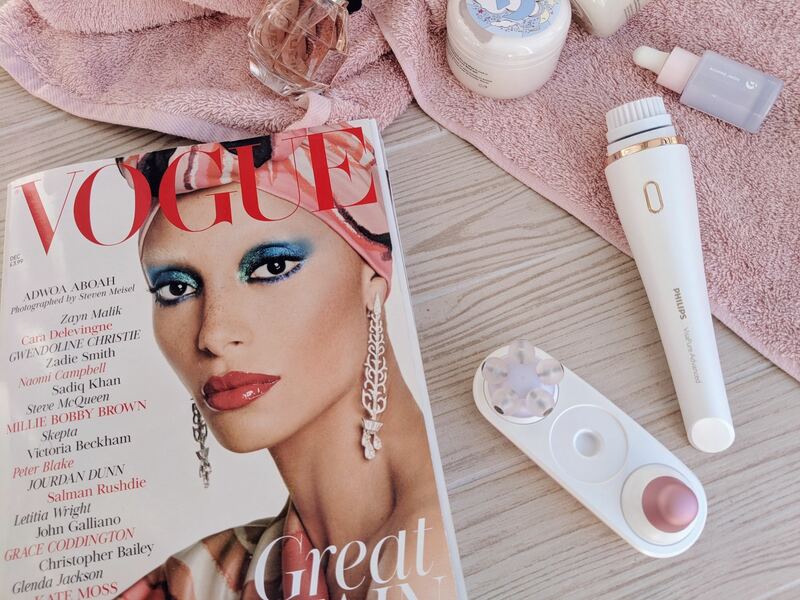 I had struggled to find a good cleansing brush that is gentle and has soft bristles (can’t stand hard bristles on any cleansing brush) but this one, whilst being gentle, actually feels like it is giving a very deep clean – not just buffing the surface. Once all of my cleanser, dirt and dead skin cells has been washed off using the revolving cleansing head, I will splash some water on my face and dry it off with a fluffy face towel. Depending on how I am feeling I will quickly apply some toner onto my skin (but I am so bad at remembering to do this). I will just apply that with a cotton wool pad and then wait for that to try for a little bit. 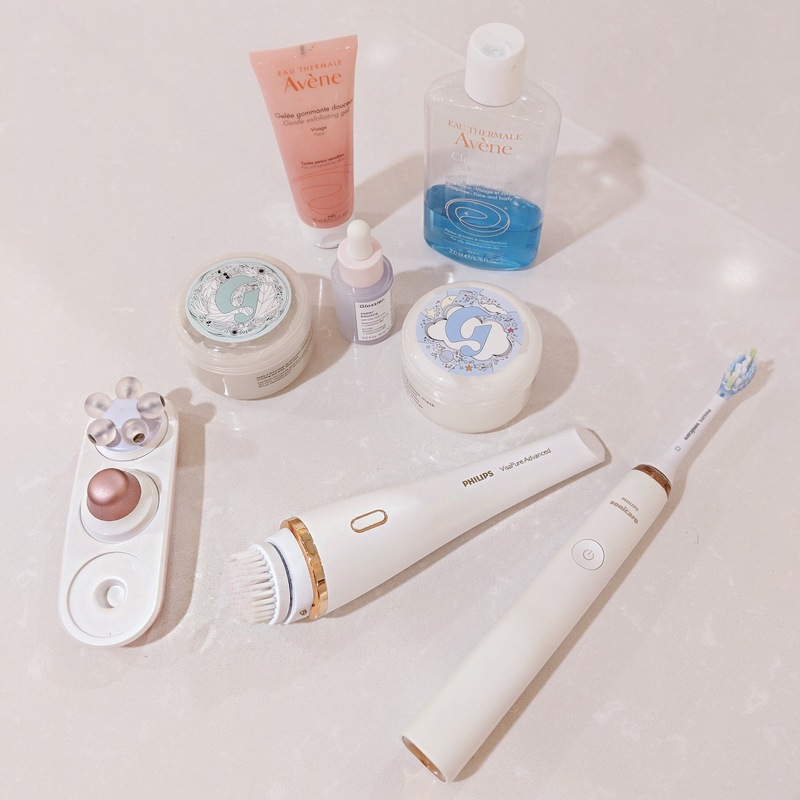 Next up – I change over the heads from the cleanser head to the facial massage head. This is by far my favourite thing that has ever entered my life. Oh my god. It is literally what it says on the tin. A facial massage. In a box. It is the most incredible feeling ever. A MASSAGE FOR YOUR FACE. EVERYDAY. So how I use this product is, I will pop a thin layer serum all over my skin. Then I massage that into my skin using the VisaPure Advanced massage attachment. This revitalising massage is designed to encourage lymphatic drainage – which sounds scary but is actually amazing and so good for you, it improves blood circulation which will lead to gorgeous, glowing, radiant skin. The rhythmic movements mimic the Japanese massage technique of Petrissage and feel like 750 finger taps to your skin per minute. I don’t know about you but that sounds heavenly to me. After my serum has been mixed in, I then apply a nice thick moisturiser. As it is winter – I am so desperate to keep my skin hydrated and protected from all the elements. Even though I have literally not left my bed for days – my skin is so dry from constantly sitting in radiator heated up air. So I make sure to pamper myself either with an over-night moisturiser or a mask. I once again use the massage head to massage in my moisturiser, which will mean that it should reach a deeper layer of skin. IDEAL. Even aside from all the benefits of this head – I would use it even if it didn’t do anything – just because it feels SO SO SO nice and so unbelievably relaxing. If I could – I would sit in front of the TV all afternoon with this massaging my face. It is so amazing for releasing any tension in your face that you have. LOVE LOVE LOVE. After moisturiser – I pop on some eye cream. I don’t use heavy eye creams that are anti-aging. I am sure that I should as I am not getting any younger – but at the moment I am happy just using light eye creams to add a little help for puffy eyes. This applicator is PERFECT for the morning as it provides a boost of freshness for sleepy, tired eyes but I will also use it before going to bed. AS I NEED AS MUCH PAMPERING AS POSSIBLE RIGHT NOW. The cool material with ceramic coating is very soothing, with the coolness making you look and feel super refreshed. 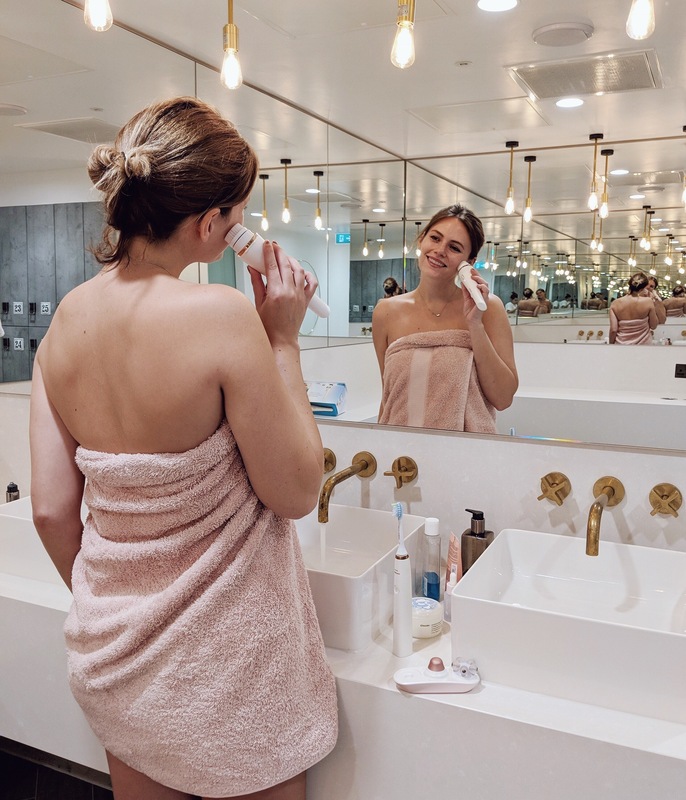 Perfect for those (too) early mornings (and I will be using this every morning to fake looking more alive and healthy) but also loving this feeling before heading to bed, feeling all squeaky clean. So that is how I am using the Philips VisaPure Advanced. 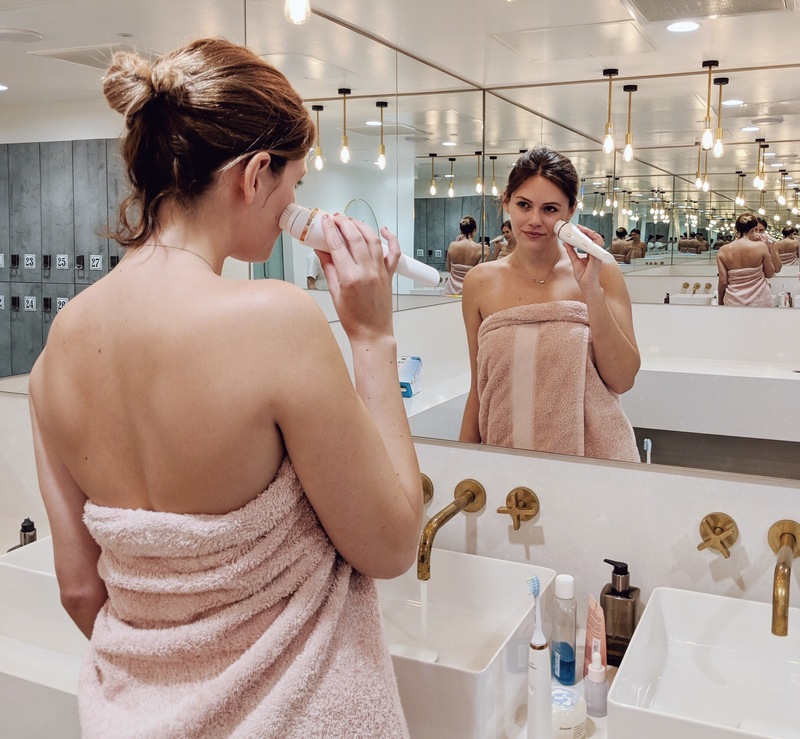 If you have been following my blog for a while – you will know that a few months ago, I was very lucky to work with Philips on another of their products – their Sonicare DiamondClean toothbrush which I am still so obsessed with and still use every single day. 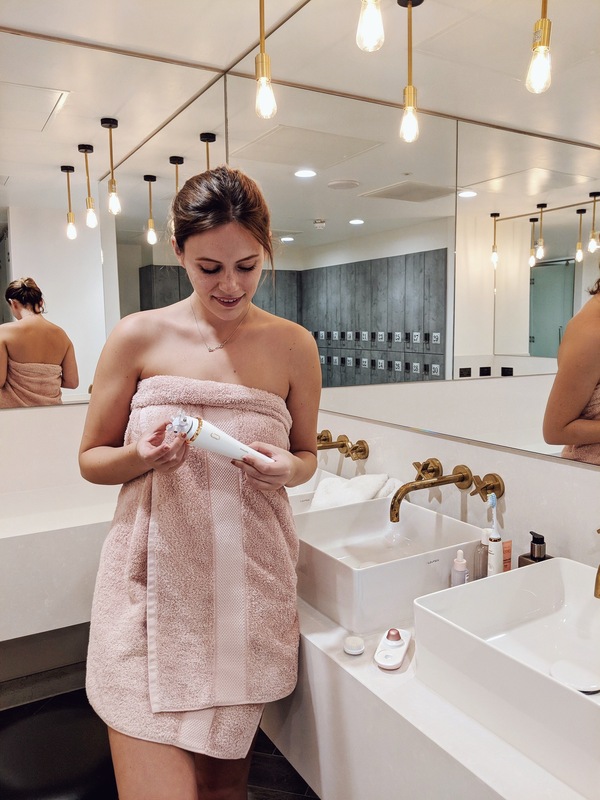 Because I was so in love with one of their products already – I couldn’t wait to try their skincare product. And I am so SO happy that it lived up to my expectations. My bathroom is now turning into a bit of a Philips shrine and I am oh so happy about it. Another product that I really, quickly wanted to tell you about is the VisaPure mini. 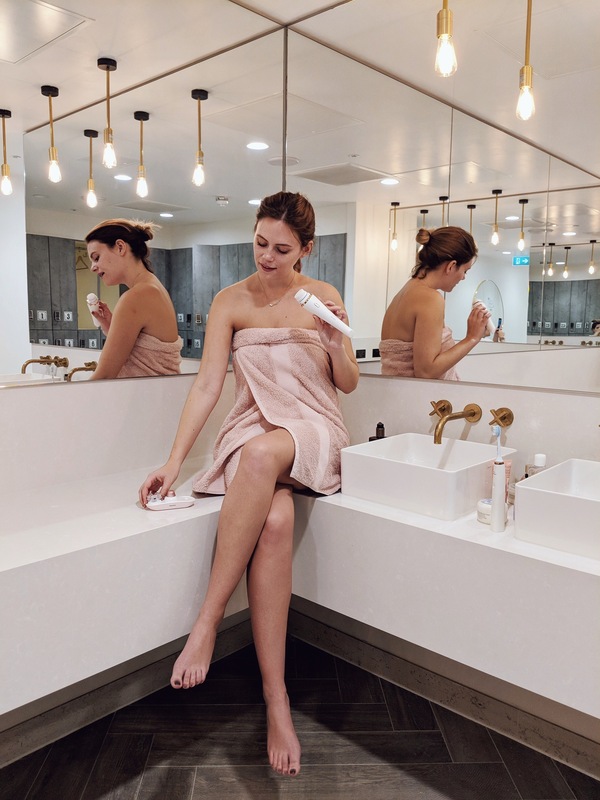 This is another god send of a cleansing brush – same principle as the VisaPure Advanced cleansing attachment and it is perfect for me as I travel a lot so I can take this with me wherever I go. I love this little chap – so cute and pink and a completely perfect stocking filler. PLUS fits in my hand luggage really easily, so my skincare routine doesn’t have to suffer when I am abroad. Philips are also having a POP UP stand in London Westfield’s White City from 1st -3rd December so head down and you can try out the products for yourself and see if it is the perfect fit for you! Thank you SO SO much for reading and I really hope I have inspired you to pick up a VisaPure Advanced. If you have any questions at all then pop them below in the comment section and I will do my very best to answer them! This post has been sponsored by Philips VisaPure Advanced – but all opinions, hype and illness are my own.